Discussion in 'Effects, Pedals, Strings & Things' started by David Vee, Oct 14, 2010. 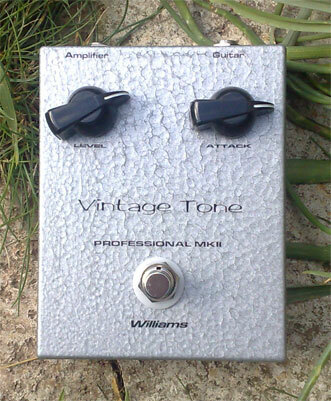 After sifting thru the forums, reviews and videos, the process of tracking down the best of the best of the Tone Bender Pro Mk II clones yielded three names: D*A*M, JMI, and Williams Audio. Well, I guess the D*A*M guy is working elsewhere these days, making his clones available thru a specific UK music shop exclusively... with their website "under construction" for months... and a link to the pedals that does not publish any ETAs. The new JMIs are equally as great as their ancestors, but I found their trail led me back to the same exclusive UK music shop... frustrating for someone on the USA side of the pond. Then I searched the Williams Audio site. Concise, informative, user friendly, not under construction, and no guess work about ETAs and availability. Nick is an upstanding fellow... his website in fact hadn't updated in time to reflect out of stock on the model I chose when I clicked in to buy... but no fear, he informed me he would send me the pedal currently being assembled on his bench... the one he was actually building for himself. (Folks, that's class.) The pedal made the journey across the pond promptly, arriving 6 days after it shipped. I chose the rarer OC81D model... named in a weblink as "the one you want" to get "that sound". That said, I expected a "very good" simulation of the sound we all know and love from, most notably, Jimmy Page on the first Led Zep album. Plugging my new pedal into a variety of amps these past 24 hrs, I got that classic Led Zep "Whole Lotta Love" tone, and a whole lotta more... the pedal is amazing, the most musical fuzz/OD I've ever played (and I own several). The pedal is simplicity, two knobs - level and attack. In front of a non-MV amp, like a Plexi, the level becomes the MV. The attack is called sustain on the original Mk IIs... and that is exactly what it is. Think violin... it's a glassy feeling as the note sustains... sweet. The odd thing about using one of these is the counter-intuitive act of turning the guitar down to get the searing lead... but who am I to argue with Mr. Page... besides, it works! The touch sensitivity of the beast allows the guitarist total control of the gain and fuzz at the guitar. The pedal is set it and forget it. Running it with a Strat, a Tele, and an LP yielded wonderful results... and not just with Plexi-type amps, but with my Fender PRRI and Swart AST Mk II. 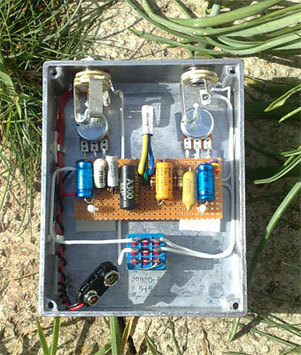 The pedal, for me at least, replaces the need for a separate OD, a separate dirt box, and/or a separate fuzz box. It is all of those things and much more. In the mean time, search out the videos of Tonebender Pro Mk IIs... there are several, then seek out Nick at Williams Audio. He is courteous, professional ... and most importantly he delivers the goods. No BS about having to deal with only one music store or chasing inflated secondary market pricing. Nick's work is reasonably priced, readily available, and absolutely second to none. Your mileage may vary... but in this case, I doubt it. This pedal is the real deal.